While many of us were preparing for Super Bowl parties last weekend, the Chinese welcomed a bronco of a different sort: the Year of the Horse. Fortunately, it’s not too late to celebrate the Chinese New Year: Festivities last for 15 days, making this the longest holiday on the Chinese calendar. Perfect for guys like me, who despite the best intentions, don’t always post holiday cards on time. My first impulse is to celebrate any holiday by firing up the grill. Peking duck? Barbecued spareribs? Tea-smoked duck? Surely the world’s most populous nation must have some killer barbecue. 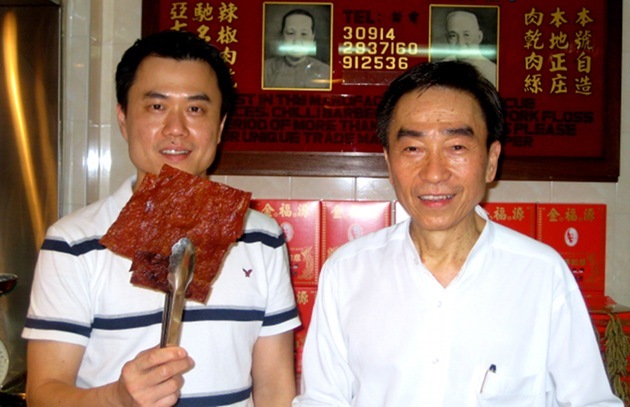 As it turns out, those the sticky, sweet-salty ribs that delight us at Chinese restaurants are baked in a special oven. (The “smoke ring” comes from red food coloring.) Peking duck? Air-dried, oven-roasted, then deep-fried. Tea-smoked duck? It’s cooked in a wok. Could it be that this ancient civilization, with a rich varied culinary tradition stretching back thousands of years, managed to overlook barbecue? On my last trip to Hong Kong, I visited the seaside village of Shek O. A half-hour drive takes you from the forest of skyscrapers downtown to the sort of laid-back beach community you might find in Southeast Asia. Vendors do a lively business selling grilling utensils and charcoal. Beach-goers set up impromptu grills fashioned from chicken wire and rebar. On the weekends, the air is fragrant with the sweet scent of charcoal-grilled chicken wings basted with honey and soy sauce. Peking duck is one of the high holies of Chinese gastronomy. The best I ever experienced came not from a fancy restaurant in Beijing, but an open-air eatery on the outskirts of Macao, where dozens of ducks—perfumed with five spice powder and ginger—roasted over a spit over charcoal. The fixings—hoisin sauce, scallion brushes, Peking pancakes—were classic Chinese. The flavor was out of this world. The ground zero of Chinese grilling is the Xinjiang Uyghur Autonomous Region in the extreme northwest of the People’s Republic of China. The Uyghurs (pronounced “wee-gur”) are predominantly Muslim. Like Muslims everywhere (and unlike most Chinese), they don’t eat pork, but they work wonders with mutton and lamb. Uyghur lamb kebabs—electrified with chili powder, cumin, and coriander and grilled on an open shoebox-like charcoal grill—are a popular street food here and throughout China. This is a great use for fatty cuts of mutton or lamb—the melting fat bastes the meat. Pork-eating Chinese everywhere queue up during Chinese New Year for bak kua, a highly addictive form of jerky. To make it, you flavor minced pork with salt, sugar, and spices, rolling it into flat sheets, which you dry and bake to a leathery consistency in the oven. The bak kua is then cut into squares before being crisped on the grill. The preparation is a bit involved, but the sweet-salty, crisply chewy, smoky sizzling pork squares are worth the effort. Do you have a favorite Chinese or Chinese-style grilled specialty? Please post photos, recipes, and details on the Barbecue Board.